Neuchâtel, Switzerland, is charming in the way all sleepy European cities are charming, only more-so. Even the graffiti is charming—"Rock and Roll" is innocently spray painted on an underpass. Strict zoning laws, World War II neutrality, and ample limestone quarries preserved its rich architectural heritage, while avoiding modernism's folly. Neuchâtel (new castle) was the only royalist government when it entered the Swiss confederacy in the 19th century, and the 12th century Romanesque castle, church, and prison parapet still dominate the skyline. A gorgeous Art Nouveau building houses a lady's shoe store, the Frisbee Nightclub Cabaret, and Le Richelieu Canna-Weed Shop across the street from the Carrara marble Monument de la République 1848. Walk a block northeast and you'll find the only beautiful Christian Science Reading Room in the world, a tasteful church fashioned in the neoclassical persuasion. It has Corinthian columns, because every building seems to have Corinthian columns. On the lakefront a few miles west of downtown sit the only two ugly buildings in the city. There's the factory, a white whale without windows that appears to have been designed by a blind Soviet commissar suffering from depression. Next-door is a 400,000-square-foot building that spurned the region's rich quarries in favor of tinted glass—the kind paparazzi-weary celebrities use when they want to be spotted by paparazzi—that give the wooden structural supports a maroon tint. Every architectural mistake has an explanation behind it, and Philip Morris International's headquarters is no different. The building, the flacks say, represents the company's commitment to transparency. They may have wasted $120 million building this hideous metaphor, but this hideous metaphor may well save the tobacco industry—and the lives of a couple hundred million smokers. They call it "The Cube." Inside The Cube, 430 research and development staffers scurry about trying to save the world's 1 billion smokers from themselves. After spending $3 billion researching smoke-free alternatives, PMI thinks it can address the decline in traditional tobacco use and help smokers quit. It is called iQOS (pronounced eye-kos). The device heats up the innards of a mini-cigarette to generate vapor and release nicotine at similar levels to cigarettes. This stick, unlike a traditional vape pen, uses tobacco in the form of thin, flat sheets to give smokers the flavor of a full-bodied cigarette. The product debuted in Japan and Italy in 2014 and will be available in 35 markets by year's end. It's been a hit overseas, gaining 8,000 new users per day, and PMI is preparing to launch it in the United States. They believe the market is ready for it, but is the Food and Drug Administration? You are greeted by four charming men from four different countries. They are polite, as all PR men are, until you make for the entrance. "You can’t bring that in here," the American says. He's talking about the Marlboro. He registers your bafflement and concedes they are happy to wait with you. You are a guest, one who received an all-expenses-paid European vacation with first-class airfare and a week of free meals, drinks, and cabs—the type of pampering that could influence even the most stalwart journalist were it not for your back-of-the-napkin calculation that you have handed the company in question enough cash to pay tuition at a private college. You oblige, not out of gratitude, but good manners. There are no drawls or twangs, no cowboy hats, no bourbon, no bowls of cigarettes here. No, Big Tobacco has gone corporate. You have entered a Silicon Valley-esque "campus"—yes, they use that word. It's all open floor plans and clear glass, Google with a few six-foot Virginia tobacco plants sprouting from the ground instead of a Zen garden. The three floors each bear the name of one of Empedocles' essential elements: earth, wind, and water. Your sherpas emphasize the fourth element, fire, is excluded—PMI’s symbolic way of showing how it’s ending combustion in cigarettes—and implore you to include this quirk, because if it doesn't make print PMI may as well have burned the fortune it spent on the consultants who told executives about Empedocles' essential elements. You reach the conference room and instead of whiskey and ashtrays, you find water, sparkling and un-sparkling. There's a PowerPoint presentation, too, delivered by the American, Joshua Townsend, spokesman for the Reduced Risk Products division. He is joined by Canadian PR man Corey Henry, Swiss scientist Nuno Fazenda, and Australian PR man Simon Dowding. They are all middle-aged, save Luca Lodato, an "External Communications Specialist." He is not as fluent in English as the others. It's not clear why he's here. The PowerPoint summarizes the years of testing PMI has done on iQOS in The Cube, where scientists flooded rooms with smoke from cigarettes and smoke from the device to measure pathogen levels. The bar graphs show iQOS eliminating about 90 percent of the FDA's list of 18 chemicals linked to cancer, 90 percent of 58 potentially harmful chemicals PMI identified, and 95 percent of 15 carcinogens. The carbon monoxide rates found in iQOS users is akin to that "of people stuck in traffic," according to Townsend. "We have no clear understanding of what ingredient is directly responsible for cancer, but basically if we can eliminate the combustion we'll cut down exposure to all of the toxicity in it," Fazenda says. Fazenda, a former pharmaceutical engineer, returns to the PowerPoint. A cloud of smoke emerges from his right. The quiet, junior member of the squad, Lodato puffs away casually, and you now know why he is here. He acts surprised when you turn your attention to him. Why yes, he did quit by using iQOS. In fact, he's one of only two PMI employees you meet that day who's actually smoked before. The nonsmokers say they took the job because they "love the challenge," which is to say that defending products as universally hated as tobacco is difficult—"challenge," it can be assumed, means "money." The data contained in Fazenda's presentation are the backbone of PMI's application to the FDA to market iQOS as a safer alternative to traditional cigarettes. Thirty-five applications have been filed to the agency's Center for Tobacco Products—zero have been accepted. If PMI is going to catch the unicorn, it must show it has changed its ways, which is why CEO Andre Calantzopoulos is playing footsy with the regulator at the expense of smokers. In July, President Donald Trump's FDA commissioner Scott Gottlieb said the agency is exploring options to cut nicotine levels in cigarettes, far beyond any regulatory action taken by the Obama administration. "We need to envision a world where cigarettes lose their addictive potential," he said. The stock price for Altria—PMI's American partner—plummeted 9.5 percent after the announcement. But Altria's loss could be PMI's gain. Gottlieb indicated the agency may couple nicotine reduction with opening up pathways for safer alternatives. He urged his fellow regulators to "keep an open mind" about the benefits of these products. "I also hope that we can all see the potential benefits to addicted cigarette smokers, in a properly regulated marketplace, of products capable of delivering nicotine without having to set tobacco on fire," Gottlieb said. "The prospective benefit may be even greater for the subset of current cigarette smokers who find themselves unable or unwilling to quit." Calantzopoulos responded to Gottlieb's attack on his company's lifeblood by endorsing it as "one of the best articulated positions in many years," in an August interview with Reuters. He dismissed the idea that PMI might challenge new nicotine guidelines, provided they come with approval for safe alternatives. "If people understand that this is not an isolated measure but something that is part of a comprehensive policy, I think we can find a solution," he said. PMI must walk a thin line, as the FDA reviews its application. For one, it must prove that iQOS will not attract non- or ex-smokers—few users fall into either category, according to the company's data from American test markets and Japan. PMI maintains iQOS is only designed to cannibalize its market-share and eat into that of its competitors. iQOS Heat Sticks cost as much as normal cigarettes overseas, in part because only smokers are used to surrendering that kind of cash. Townsend does such a good job insulting cigarettes and downplaying iQOS's appeal to nonsmokers one gets the sense that PMI's new motto is, "We're Philip Morris: We Don't Even Want Your Money." "We don't want your cigarette money," he replies. Townsend is worth every "challenge" PMI pays him. A sense of betrayal creeps into your chest. These are the guys who mailed you a Marlboro Horseshoe for your 30th birthday? The PMI you know would tell government busybodies to go to hell; instead, Townsend says, "I actually like regulation." What happened? When Reader’s Digest published a report in 1952 linking cigarette tar to cancer in mice, tobacco companies took to the turrets. In 1954, the industry joined forces to publish "A Frank Statement to Cigarette Smokers" in 400 newspapers across the country. "Statistics purporting to link cigarette smoking with the disease [lung cancer] could apply with equal force to any one of many other aspects of modern life. Indeed, the validity of the statistics themselves is questioned by numerous scientists," the statement said. "We accept an interest in people’s health as a basic responsibility, paramount to every other consideration in our business. We believe the products we make are not injurious to health." This set the tone for Big Tobacco's PR strategy for the next four decades. They fought science with (junk) science, trotted out men in lab coats to win over credulous journalists and lawmakers—two classes famously lacking in scientific training. Despite the bombshell report from the nation's most widely read publication, cigarette smoking continued apace. It took 10 years before the surgeon general's office confirmed the link between smoking and lung cancer, sending smoking rates into a tailspin. Tobacco companies continued fudging research numbers and denying smoking's link to cancer and the addictive potential of nicotine. It worked, for a time. No longer. Townsend says the company is "not interested in changing the surgeon general's mind" about smoking's harms and adds that nicotine is "clearly addictive." It's an interesting tack on the part of PMI, a form of PR jiu-jitsu that leverages an enemy's power—and few lobbies are as strong as the antismoking lobby—against them. It's a lesson learned on the playground: If you can't beat 'em, join 'em. This is why the company hits you over the head with its transparent research—each study is available online—and its transparent communications and its transparent building. The new, softer PMI has won some goodwill. Nearly all of the 34 public comments submitted to the FDA endorse granting PMI the safer alternative designation. Many are predictable: everyday citizens who want to see their brothers quit; conservative think tanks, like the Heartland Foundation, that fought against smoking bans for years. Then there's the Progressive Policy Institute, the think tank that set the agenda for President Bill Clinton through the ’90s, just as tobacco companies became national villains. 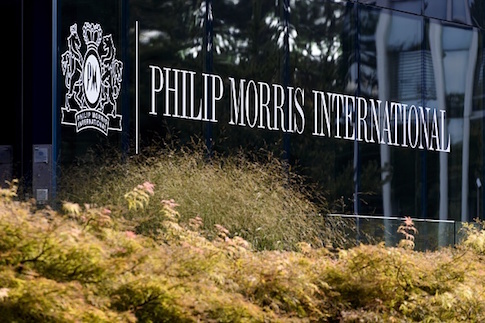 "We would like to submit comments in support of granting Philip Morris International’s (PMI) Modified Risk Tobacco Product Applications," the comment says. "PMI’s application fits squarely in our main mission of promoting innovation and growth, while improving the health of both smokers and the population as a whole." PMI figures allies like you, the customer, are here to stay—that's what the nicotine was for in the first place. They recognize the need to broaden the base by offering concessions to antismoking advocates in the regulatory and public sphere. As you exit the conference room you notice the coffee bar. It is surrounded by colorful chairs, and seated in those colorful chairs are workers, and their laughter indicates they are team-building or synergizing or brainstorming, and you look down at the literature and think, "Oh, these must be representatives of PMI's ‘diverse global workforce of more than 91,000 employees [who speak] more than 80 languages.'" Then you notice the second-floor smoking lounge and observe a solitary figure, a pair of legs, the silhouette of smoke; you can't tell whether it’s a man or a woman. It is the only room in The Cube with the curtains drawn. PMI's gamble on abandoning smokers will only pay off if the FDA gives iQOS its seal of approval, which is contingent on whether PMI's science checks out. It has convinced other regulators of iQOS's relative safety. The warning label attached to its mini-cigarettes at the Zurich airport Duty Free shop says, "This product can be bad for your health and create an addiction," a far cry from the skull-and-crossbones "SMOKING KILLS" labels found on a normal pack of cigarettes. But then, no European agency has as much power as the FDA. The agency began regulating cigarettes when President Barack Obama signed the Family Smoking Prevention and Tobacco Control Act of 2009. It created the Center for Tobacco Products (CTP) to oversee packaging and marketing, as well as approve all new tobacco products sold in the United States. CTP employs about 700 people. Big Tobacco user fees fund the entire budget, which is projected to be nearly $600 million in 2017. PMI has submitted two applications to the FDA. One would allow the company to sell iQOS. The second, filed in December 2016, is for the Modified Risk Tobacco Product (MRTP) label, which would allow the company to market it as a safer alternative. An agency spokesman said the FDA aims to review PMI's submission within 360 days, but that may be a tall order. The application is 2 million pages long. The agency has approved countless vaporizers and tobacco blends, but has yet to approve an MRTP application. PMI contends that it has done its due diligence studying iQOS after performing eight clinical trials detailed in the application. Those tests, conducted in the United States, Japan, and Poland, ranged in size from 60 to 1,600 participants at a cost of $45,000 per participant. PMI allowed several teams of researchers to test iQOS, including Greek cardiologist Konstantinos Farsalinos, who released his results at the Global Forum on Nicotine in Warsaw. "Who believes tobacco companies anymore? No one," Farsalinos says as PMI's in-house test results appear on the screen. Then a new slide with new bar graphs comes up—these ones from Farsalinos's testing. "They are pretty much identical" to PMI's findings, he says. "It looks like PMI is telling the truth." Here, he is interrupted by laughter. "Sooner or later we would have found out in any case so I don't see a reason why they would lie." He observed 60 to 90 percent reductions in toxins across the board, while iQOS had slightly higher chemical levels than e-cigarettes. Farsalinos is convinced it is a safer product, though he still distrusts Big Tobacco. "We do need independent studies … in order to verify their very good science, but not with a good reputation," he says. An independent study led by Dr. Reto Auer of the University of Bern argued that iQOS continued to release chemicals linked to cancer, in some cases at higher rates than that of cigarettes. PMI mailed a letter of complaint to the university and posted a review of the data online. Its scientists argue that Auer generated his results by underestimating chemical rates in combustible cigarettes, in one case by a factor of 50. The whole report is worth the read if only to grasp the Twilight Zone nature of the world's largest tobacco company criticizing scientists for saying cigarettes are too healthy. Farsalinos also disputed Auer's findings. Auer declined an interview request, referring the Washington Free Beacon to a university spokeswoman. "PMI's approach is disturbing, since it attempted to directly intervene in the university hierarchy by influencing the administrative superiors of the researchers, instead of entering the scientific debate directly," she said in an email. Auer and his team are in the midst of responding to PMI's critique, as well criticism from researchers at the University of Bologna. Dr. Richard Sachleben, a retired pharmaceutical chemist and member of the American Chemical Society's Panel of Experts, has followed some of the data on PMI's website, though, as a nonsmoker, he is neutral about whether it deserves FDA approval. He says there could be merit to PMI's science, as well as that of Auer. He points to polycyclic aromatic hydrocarbons (PAHs), which were central to Auer's study. PAHs can be released at lower temperatures than that of vaporizing products, just as a cigarette's nicotine is released long before the flame reaches its location. "There are certain chemicals that have shown to be cancer causing that can be released by either heating or burning," Sachleben says. PMI's success in the United States hinges on how the FDA navigates this scientific debate. Its chief rival, British American Tobacco, saw sales boom in the United Kingdom when it became the first tobacco company to license a nicotine inhaler as a medicine in 2014. The Brits are nipping at PMI's heels for cigarette alternative supremacy, having invested $1 billion in noncombustibles that resulted in its own heat-not-burn product. "[Heat not burn] is becoming reality in a growing number of places," Townsend says. "This is where the market is shifting." The question remains as to whether smokers will shift to iQOS. R.J. Reynolds rolled out the heat-not-burn Eclipse in the early aughts. Reynolds was never able to market it as a safe cigarette. Sales flopped. Production ceased in 2015. Eclipse was ahead of its time. It debuted before lawmakers realized cigarettes were a cash cow, and voters looked at smokers as decent human beings with a vice rather than enemies of the state. Smoking bans were for places like New York City and California, not North Carolina and Virginia. iQOS enters a marketplace that has changed: Packs are more expensive, everyone hates smokers, and smokers have shown a proclivity to quit when given another option. Great Britain is often cited as vaping's greatest success. Of the nation's 9 million smokers, 1.6 million quit using e-cigarettes, thanks in part to the government's endorsement. While there was an initial rush to vaping in the United States, the numbers have plateaued in the past two years. That's the market iQOS is after. "People by and large who could quit smoking with vaping have already done it," says PMI spokesman Henry. "There's still a segment that can't fully achieve it" without tobacco in the product. Japan is heat-not-burn's version of Britain. In three years, operating in only a handful of cities, iQOS has corralled 10 percent of the Japanese tobacco market; the nation's smoking rate fell 2 percent between 2013, the year before iQOS launched, and 2016. "You would see wives marching their husbands into our stores," Dowding, the Aussie PMI rep, says. The company estimates that more than 70 percent of Japanese smokers who tried iQOS quit smoking as a result. Japan pioneered antismoking bans, not for public health reasons but because sidewalks are so crowded a smoker was liable to burn a hole in someone's suit. Light up at a traffic light in Tokyo, and people will scold you to "take that inside where it belongs." iQOS users can brandish their tools in public; nonsmoking sections in restaurants welcome them. The Global Forum on Nicotine takes place at the Warsaw Marriot, which only allows smoking in its casino. At each panel break, there's a rush for the balcony overlooking the Palace of Culture and Science—a "gift" from Joseph Stalin. Simon Leysen, a Belgian communications professional, joins us on the balcony. He fumbles in his pocket and withdraws an iQOS. He smoked for 25 years before finding the device during a business trip to Germany. He mounted two serious quit attempts during that time, once with patches—"lasted a week"—and once cold turkey—"lasted 3 or 4 weeks." He hasn't touched a cigarette in 5 months. "Now I prefer the taste. It's a much nicer experience," he says. "It was effortless. It had the same ritual, that's the part I like about it. The urge is gone." The procedure is simple: You pop in the full flavor, a blend of Virginia, Burley, and Oriental tobacco, and wait a couple seconds for the device to heat up between 200 and 350 degrees Celsius (a normal cigarette burns between 800 and 900 degrees Celsius). The taste hits you and it is … a good effort. The flavor evokes that of a cigarette, but a very specific one: the first one you have after waking up with cottonmouth, the stale taste of Keystone lingering on your tongue. The menthol tastes better than an actual menthol cigarette. It carries a subtler mint taste that allows the tobacco grittiness to linger, rather than the overpowering mouthwash mint of a Kool. One of the biggest critiques smokers have about e-cigarettes is the pull, which insiders call the "ritual." A vaporizer offers no resistance, no bite to let the throat know to stop inhaling. One hit off a vape and you now understand the appeal of freebasing crack through a curtain rod, which is to say there is none (at least crack offered crack). The filter in the iQOS is just for show, designed to mimic the ritual of smoking to trick the smoker's mind into thinking this is a cigarette and not a crack pipe. The draw is perfect. You have 14 puffs—the same in an average cigarette—before the light goes from green to red. The stick is cool to the touch. All the tobacco, roasted black like coffee, is accounted for; the filter is still white. You must wait four minutes for the device to recharge in its slick flip-phone-sized charger before smoking another, but you can't help but notice your leg has stopped shaking. I remember my first cigarette. It was an unseasonably cold spring day; the dark had settled over campus, an actual campus, not some codeword for industrial cult. I can picture the quartet of sophomores. Matt was a math and physics genius, traits he obscured under a constant haze of weed. He gave me the Newport over Spencer's objection. Spencer was a Taoist, pockmarked with a middle-parted bowl haircut popular among Disney heartthrobs in the mid-1990s, and clad in a trench-coat that went out of style after Columbine. Teddy could grow sideburns at 13; we rode the bus together. Rachel was waiting for a ride home from her older brother; I thought I could impress her. I remember the ignition of the 80-millimeter stick, the bitterness on my tongue, the pleasant mint aftertaste that soothed my burning throat, the struggle to suppress a coughing fit, the bout of lightheadedness. I knew right away. I would spend the rest of my life standing in circles like this, idly talking to a group bound by common consumption. Our elders beat us over the head with the "public health crisis" rhetoric, sneering that we'd drop like flies in our 50s and 60s, while our peers coasted into their pension years. The innovations of the e-cigarette and heat-not-burn market have changed what it means to be a smoker. Big Tobacco can't afford to be frank with FDA approval hanging over their heads, so a Canadian academic has to. University of Ottawa Law School professor Dave Sweanor wears a hideous mini windowpane blazer of brown and cream and slouches on the khaki sofa at the Warsaw forum. A man asks him if he worries that teens who take up smoking alternatives will end up smokers. "The sorts of young people who might be attracted to doing this are the sorts of young people who would otherwise be smoking," he says. "I'm not even all that concerned about the young people because there are far fewer of them now who take up smoking. Because we know if you've got viable alternatives, they can get off smoking." Sweanor posits that smoking is no longer a death sentence fueled by addiction; we now have the potential to make it a phase. The FDA does not see it that way. The descent of the dread cancer stick has coincided with the outburst of opioid deaths—the type of products the FDA was actually created to regulate. Commissioner Gottlieb sees no difference between the two. "I’ve pledged a deep commitment to taking aggressive steps to address the epidemic of addiction to opioids. I view our opportunity to confront addiction to nicotine with the same obligation," Gottlieb said in July. "I’ll pursue efforts to reduce addiction to nicotine with the same vigor." The comparison brings me back to high school and what became of the quartet of sophomores who got me hooked. Teddy is a hotelier in Baltimore. Spencer hung himself in jail while suffering from heroin withdrawal in 2006. Rachel overdosed in 2011. Matt's serving a 5-year prison sentence for supplying the heroin that killed his girlfriend a couple year's back; he's up for parole in December. It turns out this generation faced a much more harrowing public health crisis than tobacco—one that kills before it can ever be reduced to a phase. Update 3:25 p.m.: A previous version of this story said that Japan allows PMI to market iQOS–which does not stand for "I quit ordinary smoking"–as a safer alternative. It does not. This entry was posted in Culture and tagged Smokes, Tobacco. Bookmark the permalink.